The team at Happifeet Podiatry are experts in dealing with foot and ankle problems in both adults & children. They specialise in how your feet, ankles & legs affect the rest of your body. St Cat's FC is proud to announce Happifeet Podiatry as one of our 2019 Field Sponsors. Pain can stop you from doing what you love most and greatly affect your ability to live your life to the fullest. Children's feet are constantly growing so providing the correct shoes and support is crucial in these early stages. Happifeet Podiatry can help you care for your skin & nails as they also specialise in difficult to cut nails, including ingrown toenails. They sell podiatry approved shoes and sandals for both men and women and can also order custom fitted shoes for your difficult to fit feet. They love designing arch supports for your feet to alleviate pain, improve your posture and help prevent wear and tear on your joints. The Happifeet podiatrists regularly use acupuncture needles (western medicine acupuncture/dry needling) to help relieve pain for a range of conditions. 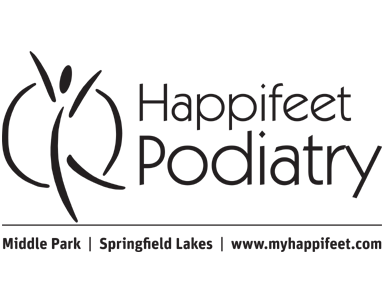 Contact Happifeet Podiatry today by phone on 07 3818 6300 to book a time with one of their podiatrists at either the Springfield Lakes or Westlake clinics. Happifeet Podiatry is one of only five Field Sponsors that support St Catherine's United Football Club with extended sponsorship support. You will see their signs around Peter Lightfoot Oval.